It's a question that astronomers have been asking ever since it was realised that much of the visible Milky Way is a thin rotating disk of gas and that therefore the Milky Way is a spiral galaxy. Some authors, even professional astronomers, use the term "arm" to refer to relatively small structures in addition to major galaxy-dominating features. For example, this Milky Way image from the Chandra X-ray Observatory's website shows 8 "arms". On this website, these smaller structures are referred to as "arcs" or "spurs". The term "arm" is reserved for a major coherent structure that winds around most of the Milky Way. Yvonne and Yvon Georgelin's four arm model of the Milky Way, described in the famous 1976 paper	"The spiral structure of our Galaxy determined from H II regions" has captured the public imagination and has been used as the basis for many (highly speculative) text book illustrations. However, in fact, there is no consensus among professional astronomers about how many arms the Milky Way has or even how important spiral arms are compared to other structures. A recent review by the Georgelins' colleague at the Observatoire de Marseille, Delphine Russeil, "Star-forming complexes and the spiral structure of our Galaxy" ultimately endorsed the four arm model, but she noted: "Taking into account the error bars, a simple visual inspection of [known star-forming complexes] ... does not show any large-scale spiral structure." Other astronomers support a two arm model or even argue that other structures such as molecular rings are more important than spiral arms in describing the structure of the Milky Way. The uncertainty makes mapping the Milky Way even more interesting. Every new distance estimate adds a piece to the puzzle. We are still in the early days of galactic exploration. And in the mean time there is already much known about our region of the galaxy that is worth exploring. You can try to identify structures yourself in the overview map. 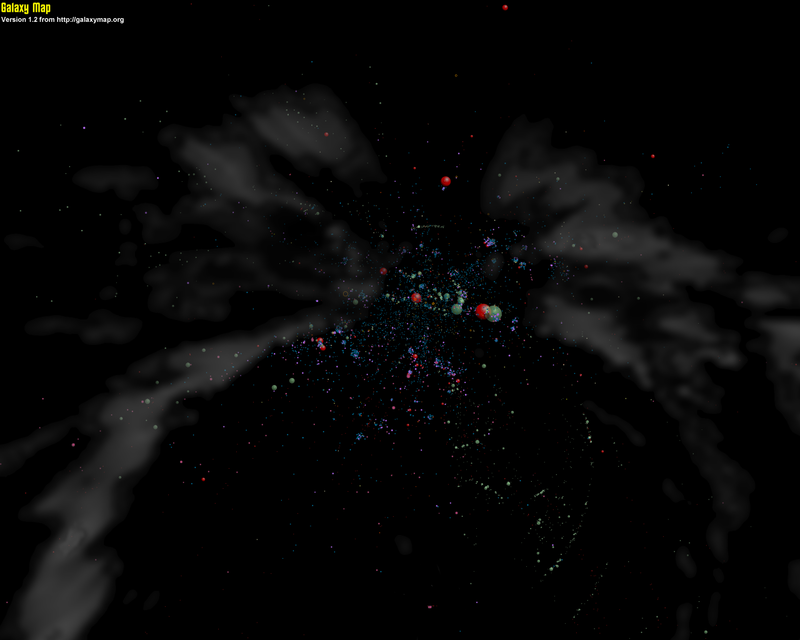 You can zoom or pan around the main galaxy map to find out more. The main and overview maps are based on the scientific literature but there is still lots of uncertainty. Beware of dragons.